Active-matrix organic light-emitting diode (AMOLED) represents a rapidly growing and promising technology for all display applications. Based on planned investments, NPD DisplaySearch forecasts that the market will grow nearly tenfold from 2.3M square meters in 2012 to more than 22M in 2016. Most AMOLED capacity is currently dedicated to small/medium production for smart phones, but much of the capacity increase going forward is expected to be driven by fabs dedicated to TV production. There are many unknowns about how far and how fast it will develop, though, since AMOLED technology has not yet been proven in large-size TVs. According to the NPD DisplaySearch AMOLED Process Roadmap Report, the manufacturing cost of a 55” oxide TFT-based AMOLED using white OLED with color filters is 8 times that of a high-end 55” TFT LCD display of equal size. 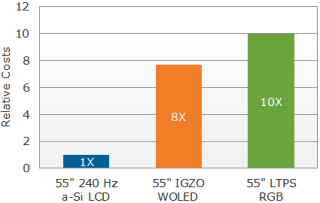 The cost multiplier of a 55” AMOLED module using red, green, and blue OLED is 10 times. These higher costs are mainly a result of low yields and high materials costs. Note: Based on current yield and material cost assumptions. IGZO: indium gallium zinc oxide. WOLED: white OLED with color filters. LTPS: low temperature polysilicon. RGB: red, green, blue (direct emission) OLED. Due to greater process maturity, the manufacturing cost premium for a 4” AMOLED is less than 1.3 times that of a similar-sized LCD. Samsung Display has been successful in its small/medium AMOLED production because it has been able to raise yields to near-LCD levels. This implies that manufacturers can potentially lower large size AMOLED TV costs to be competitive with LCD TVs in the future. In order to scale up to large sizes, advancements in several aspects of AMOLED manufacturing are needed, including the active matrix backplane, organic material deposition, and encapsulation. Because oxide TFT requires lower capital costs and is similar to existing amorphous silicon TFT, it offers an alternative to the low-temperature polysilicon (LTPS) TFT currently used for AMOLED. However, there are many hurdles for mass production of oxide TFT, particularly threshold voltage shifts, which are continuing to prove problematic for AMOLED production. While indium gallium zinc oxide (IGZO) and other forms of oxide TFT show great promise for backplanes, progress in scaling up LTPS production is also being made by increasing the excimer laser beam width to 1300 mm. In addition, the current method of depositing red, green, and blue materials by evaporation through a fine metal mask is being continuously improved. Pixel densities of 250 ppi are now possible, and over 280 ppi is feasible.